Prithviraj Sukumaran's upcoming release Adam Joan finally gets a release date. The film, which is tipped to be a revenge drama stars Bhavana and Bollywood actress Mishti Chakravarty in female leads. 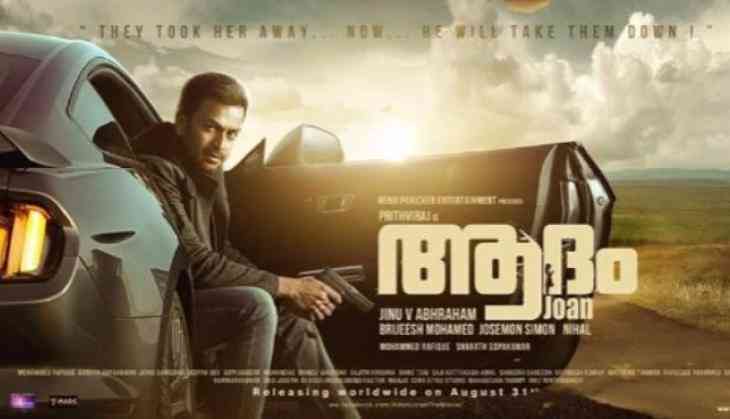 Jointly produced by actor-writer Renji Panicker, Brijeesh Mohammed, Jose Simon and Nihal under their respective banners Renji Panicker Entertainment and B Cinemas, it is the directorial debut of Jinu Abraham and Malayalam acting debut of Mishti. It has been now confirmed that Adam Joan will be hitting the screens on August 31 during the On weekend.. The makers also released a new poster on Thursday, which carries the release date in it. Interestingly, Prithviraj's 2016 revenge thriller Oozham too was an Onam release. Adam Joan also features Narein, Rahul Madhav and Lena.